Cruel Beauty is the type of retelling that's so twisted that it actually works. The classic Beauty and the Beast tale mixed with Greek mythology makes a gripping and powerful story about love and so much more than that. I'm a sucker for retellings and Greek mythology so I was eager to read Cruel Beauty. Two favorites in one book. Awesome, right? Thankfully, it did not disappoint. 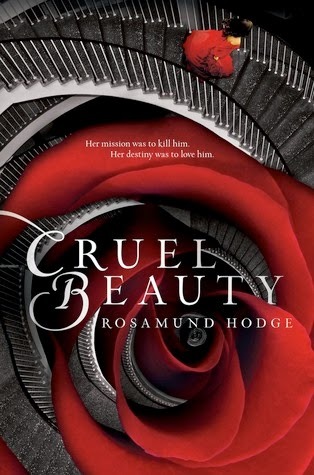 Right from the start you can see the familiar elements that makes it similar to Beauty and the Beast but Hodge successfully added her own twists to make the story her own. We have Nyx, a strong young woman filled with both love and anger. Nyx was raised to fulfill one mission: to marry the prince of demons, Ignifex, and to kill him. Her father foolishly bargained with the Ignifex himself. After years of not being able to conceive a child, he asked for children. Ignifex made good on his promise on the condition that one child will be his wife. Of course, his bargain contained convenient loopholes. The mother died after giving birth to Nyx's twin sister, Astraia. While Nyx's existence revolved around her impossible mission, Astraia grew up loved and treated like a princess. It was quite understandable how angry Nyx was at her family, even at Astraia whom she loved deep down. She's never experienced genuine care and love her whole life so I can understand why she's full of resentment. But at the same time I can also feel how conflicted she is. No matter how angry she is, she's also motivated by love. She wants Arcadia back to the way it was when the sky was still blue and demons weren't freely roaming around. She wants a better world for her sister. She wants her father to love her the way he loves Astraia. I love how complex Nyx is. Even when she was inside Ignifex's house, when she was confused between her mission and her growing feelings for him I still found her to be one of the best female leads in young adult fantasy novels. Everything about Nyx was simply believable. Then we have Ignifex, the equally complex Gentle Lord. For some bizarre reason, I never thought he was threatening. Of course he was despicable, what with all his shady bargains and demons he can control. But I somehow found his evilness to be... alluring. (Does that make me creepy?) His witty sense of humor makes him all the more irresistible. I especially liked the way he treated Nyx with such fondness. He was so vulnerable around her. The more time they spent together, the more Nyx discovered. She soon realized that there's so much more to Ignifex and his history. I like that there really isn't just one side to this tale. There's so many layers to the story that I was guessing up to the very end. The pacing was steady. The writing, captivating. Characters, all different but contribute greatly. And the Greek mythology was incorporated smoothly. What I didn't like though is how fast Nyx fell for Shade, Ignifex's shadow. I get that she's craving to feel loved but it was still a little too fast. Oh and the ending... I didn't really get it much but no biggie. I still love the book and will recommend it to every reader who has yet to experience this beautiful story from Rosamund Hodge. Ahhh. I'm excited to read this one. Hopefully, I can find a hard copy of this book. The cover's gorgeous.